While some cheeses (e.g., Cottage cheese) are formed from a casein gel formed at the isoelectric point of the caseins, most cheeses are formed from a rennet gel. An important step in cheesemaking is the removal of much of the water from the gel (fat and protein are concentrated approximately 10 fold in many varieties). Dehydration results from a process known as syneresis, in which the rennet (or acid) gel is cut and the gel pieces contract expressing the liquid trapped within (the whey); the solid material is called curds. The process of syneresis is assisted by increasing the temperature of the curds-whey mixture (“cooking”). Cheese curds are salted by brining or by the application of dry salt. Fresh cheese curd has a bland flavour and rubbery texture and it is during the ripening phase (6 months to 2 years for Cheddar) when flavour develops. 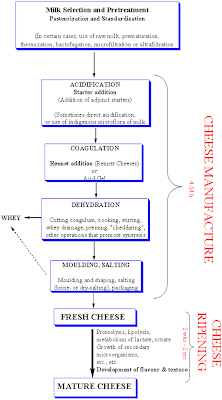 The principal steps in the manufacture of a rennet-coagulated cheese are shown above.